One man and his dog have been rescued after they became stranded in the Bristol Channel. A Coastguard-coordinated rescue in the Bristol Channel last night (Thursday 24 July 2014) has underlined the importance of ensuring a vessel is seaworthy and properly equipped before taking to the waves. 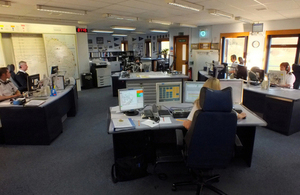 Just before midnight, the Swansea Maritime Rescue Co-ordination Centre were contacted by the police who had received a call from a mariner, accompanied only by his dog, whose 17ft sailing boat had become stranded mid-Channel, just south of Lundy Island, after the outboard motor failed. Upon further investigation it was discovered that the vessel was one of the least seaworthy that Swansea Coastguards had encountered in a good while: its hull was leaking, the mast was missing, with an old windsurfing rig serving as a poor substitute; the boat had no lights, no VHF radio – the sailor contacted the emergency services on a mobile phone – and his GPS device wasn’t working, so he was unable to give his position. Coastguards had to use onshore telecommunications beacons to estimate his location to within 30km. The optimistic voyager, who had also neglected to carry any charts, informed Coastguards that he was en route to the Hebrides, having set out from Instow, North Devon. Coastguards had to use onshore telecommunications beacons to estimate his position to within 30km. This enabled them to task the search and rescue helicopter from Chivenor who spent two hours searching for a boat in the dark with no lights on, and just after four in the morning the sailor and canine companion were winched from the boat. RNLI’s Appledore lifeboat was tasked to recover the vessel from a position 2.5 miles SSW of Lundy so that it was no longer a danger to shipping in the busy Bristol Channel. The volunteer lifeboat crew returned to station at 0915 in the morning, ready for a full day’s work. So many things were wrong with this gentleman’s boat and lack of preparation that the situation was almost comical. He had taken to sea in what was effectively a leaky fibreglass hull, without even the most basic communications and safety equipment. Thankfully, weather conditions were calm, he was avoided by other vessels in the area and he was able to use the only piece of communications equipment he had to hand – his mobile phone – to raise the alarm. However, the situation could have been far more serious and he and his dog were lucky that they were rescued promptly. We would remind anyone in trouble at sea or on the coast to dial 999 and ask for the Coastguard. The sailor and his dog were both reported to be unharmed by their ordeal.